Fleeing his assailants through deserted alleyways, Thomas Hunter narrowly escapes to the roof of a building. Then a silent bullet from the night clips his head . . . and his world goes black. From the blackness comes an amazing reality of another world--a world where evil is contained. A world where Thomas Hunter is in love with a beautiful woman. About "Circle #01: Black (#01 in Dekker Trilogy The Circle Series)"
Fleeing assailants through deserted alleyways, Thomas Hunter narrowly escapes to the roof of a building. Then a silent bullet from the night clips his head ... and his world goes black. Every time he falls asleep in one world, he awakes in the other. Yet in both, catastrophic disaster awaits him ... may even be caused by him. Customer Reviews For "Circle #01: Black (#01 in Dekker Trilogy The Circle Series)"
Ted Dekker is known for the way he builds a world, but Black is above them all. The imagery he uses, the colours and the contrasts of good and evil are incredible. 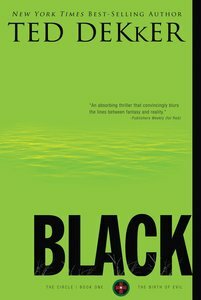 Black is the first book in The Circle Series. A fantasy in which a man named Tom dreams of another world whenever he falls asleep. But is it just a dream or are there real world consequences? This is a beautiful allegory which you wont be able to put down. Unavailable. We are unsure when this item will be available to ship. Other edition is available. 9781595547309 0 Available. Unavailable. We are unsure when this item will be available to ship. Other edition is available. 9781595546821 0 Available.